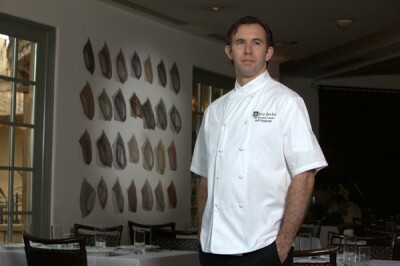 Jeff Fitzgerald, Executive Chef at Dio Deka. Former sous chef Jeff Fitzgerald is taking over as the new executive chef of Michelin-rated Hellenic restaurant, Dio Deka in Los Gatos. As executive chef, Fitzgerald says he plans on revamping the menu by utilizing new products and techniques, with a focus on local, in-season produce. One of the new dishes on the menu is a risotto that incorporates new vegetables, such as spring radishes and pea shoots. Dungeness crabs, Alaskan Halibut and King Salmon are some of the main proteins Fitzgerald plans on using for dishes. A San Jose native, Fitzgerald grew up eating fresh produce from the family garden and fresh fish caught from boat trips in Moss Landing. Appreciating and incorporating fresh ingredients is something Fitzgerald continues to do at Dio Deka, where he receives local produce from farms in Watsonville, San Francisco and Morgan Hill. Although the signature dishes, such as the moussaka, will stay the same, half of the menu will be updated with Fitzgerald’s new creations. Though he considers former executive chef Marty Cattaneo a mentor, Fitzgerald says he’s looking forward to putting his own spin on things, yet still embracing Californian Greek cuisine. “I think the restaurant is moving forward in a way that respects Greek traditions, Greek food and techniques with a more modern view and a California perspective,” he says. Finding more dining options with the LosGatos.com restaurant directory. Dio Deka is the Best of the Best in Greek cuisine. I very excited with the new seasonal menu approach Chef Jeff will be introducing.